Canon 500D, 5D MKII and Leica M-E.
Canon Rebel 300, FED-2, Zorki, Bessa R2M, Leica M4-2, Smena-8M. Agfa Billy Record, Ihagee Ultrix-Simplex. EF(-S) mount: Canon 70-200 F4 L, 24-105 F4 IS L, 16-35 F2.8 II L and 24 f2.8 STM. Tamron 28-75 2.8. LTM mount: Jupiter-3 and 12 (Russian Biogon s/n), Industar 26M, Canon 50 1.8 LTM, Ultron 28 1.9 ASPH. M mount: Summicron 50 v4 ELC and Leica Summarit-M 35 2.5. DSLR: Canon 430 EX II, Nissin Di622 and YN-468. Film scanners: Epson V500 and Plustek 7200, 8200i. Vivitar E36 and Omega 5D XL. Who cares, it's the picture that matters. and the list goes on and on. I have been into photography on and off since the early eighties, got lots of odds and ends laying around, sold some, given some away but I'm still a packrat. 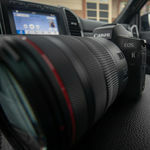 Sold a EF-S 17-85, EF-S 10-22 and EF 50mm f/1.4 before starting to ask for feedbacks.